In nature, mineral specimens of Rose Quartz (cuarzo rosa in Spanish), can be found as groupings of lacy crystals. 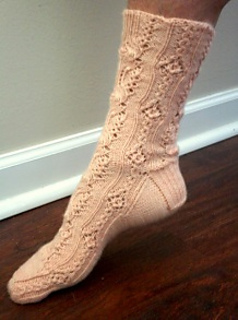 These amazing clusters of delicate pink crystals are the inspiration for this lace sock design. The lace begins in the ribbed cuff then grows into more substantial formations along the leg and down into the foot. These socks are knit cuff-down to the toe and feature the traditional heel flap and gusset construction method. Directions are given both in charts as well as line-by-line written instructions.